Year after year, Black Friday proves itself to be one of the most lucrative days for retailers. Chain Store Age, a renowned retail publication, put Black Friday at the top of its list for the busiest shopping days of 2018. Growing just as much in popularity is Cyber Monday. A newer shopping holiday, Cyber Monday came to be in 2005. It’s the Monday after Thanksgiving weekend. Unlike Thanksgiving evening or Black Friday, when many a shopper still raids brick and mortar stores, Cyber Monday shopping is done exclusively online. Although we’re several weeks away from Thanksgiving, it’s not at all too early to deploy your Black Friday and Cyber Monday email campaigns. In fact, most companies start planning their marketing strategies well before Halloween! If you’re not quite there yet, don’t worry. In this article, we’re sharing 10 of the best Cyber Monday emails, Black Friday email subject lines, and everything in between. These ideas can hopefully shape your massively successful campaign for 2018. According to Campaign Monitor, in 2016, Cyber Monday email volume increased by 42 percent. Black Friday email volume was up as well by 55.4 percent. With such high email volume, you can almost guarantee that all the competition and then some are going to be sending emails to your target audience on Thanksgiving weekend. It’s unavoidable. That makes for a lot of emails to sift through for the average consumer. While a subject line will get them opening an email (more on that later), eye-catching elements will keep them clicking through. Take a look at what we mean below. This email from retailer J. Crew would definitely make you stop in your tracks. The brand could have filled their email with images of their shiny new stock or items on sale, but they didn’t. Instead, they went one of the simplest ways possible, using a giant mouse to advertise their holiday sales. This is eye-catching for a few reasons. First, there’s the bright red background, which is sure to catch attention. Second, the copy, “get your mouse!” with the addition of an actual mouse almost makes you do a double-take. This is true even if the mouse does have drawn-on wintry garb. Considering that Cyber Monday is all about those online sales, we think this is a cute, effective, yet tongue-in-cheek Cyber Monday email example. In 2014, Kapost found that, compared to passive content, you can get two times the conversions with interactive content. Surely this data has only grown truer in the four years since. That’s why an interactive email could be your ace in the hole on Black Friday. After all, Black Friday emails are incredibly common. Any company that sells something wants to get in on the great sales potential. Giving your subscribers something fun and fast to do when they open your email could make it more memorable. Take a look at this Black Friday email from clothing brand Forever 21. You had three scratch-off options to choose from, all of which would give you savings on your Black Friday shopping. Since you were only digitally scratching, it probably took seconds to reveal what your deal was. Interactivity like this is perfect. The subscriber wants to save some dough, so of course, they’ll participate in your deal. Just make sure you make it entertaining and rewarding to get money off. If it’s a chore, subscribers likely won’t bother. Black Friday email blasts are sometimes a necessity to get subscribers’ attention. 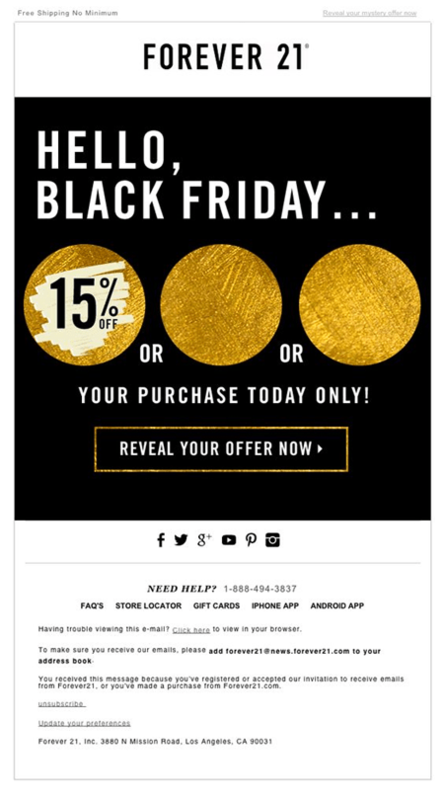 Check out retailer Urban Outfitter’s Black Friday email blast from 2015 to see what we mean. They sent a single email on Thanksgiving reminding their audience that Black Friday was soon arriving. Everyone knows it’s coming up on the calendar, but an email like this puts Urban Outfitters in the subscriber’s mind. By sending a single email on Thanksgiving, you’re not disrupting anyone’s family time too much. Then, once midnight rolls around, it’s fair game. Urban Outfitters spread its emails over several days to incentivize its subscribers to shop. The subject lines themselves were simple but effective. 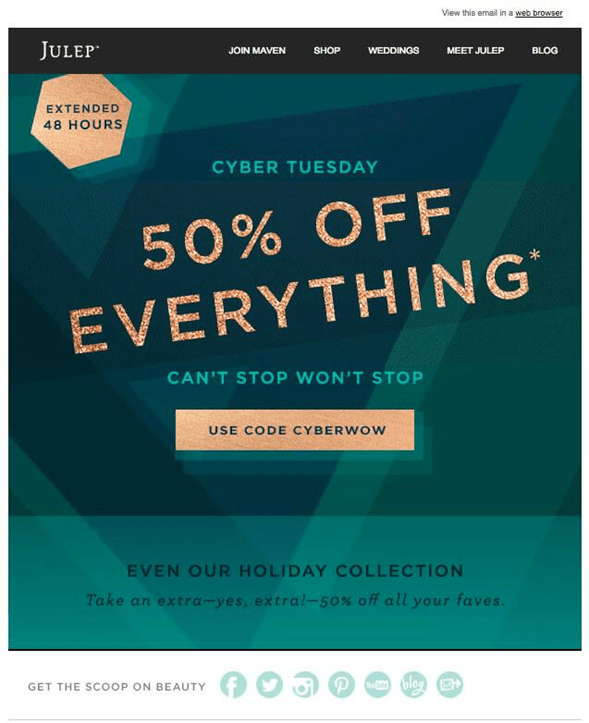 Urban Outfitters only capitalized important words like “today,” “happening now,” and “almost over.” If you’re just skimming emails, as people are apt to do on a busy day like Black Friday, then it’s hard to miss subject lines like these. The best black Friday email subject lines may look like something else entirely depending on your company. For example, you might use personalization or emojis. Stick with what’s worked for you and don’t forget to A/B test! Here’s a good way to get your subscribers wide awake from their turkey-induced food coma: send an animated email with a GIF or video animation. Not only will you catch your subscribers’ collective attention, but you’ll boost your open rates and click-through rates. Campaign Monitor found that click-through rates can jump by nearly 50 percent and open rates by 19 percent with animated content. 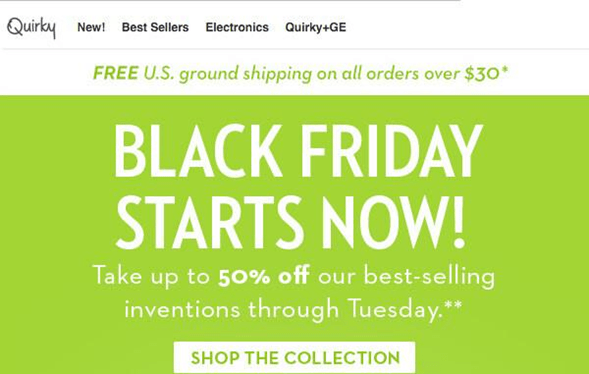 Inventions platform Quirky sent an email worthy of its namesake on Black Friday one year. Their animated email featured a whole slew of items emerging from a Quirky box. There’s everything from the fantastical (whole turkeys, pies, unicorns, and rainbows), to the feasible (tote bags and makeup trays). If you saw an email like this on a sleepy Black Friday morning, we’re sure you’d at least be curious enough to click. You know what FOMO is by now since we’ve discussed it on this blog many a time. Just in case you need a recap, FOMO stands for fear of missing out. Although we marketers always treat our customers and leads well, we can sometimes use fear to drive purchasing decisions. Take the flash sale. They’re extremely common on Black Friday and Cyber Monday alike. Items will be steeply discounted but at very limited quantities. If you see a sale like this, you want to jump on it, as it definitely blinks and you’ll miss it. Here’s an example of automotive brand AutoZone using scarcity well. They had a flash sale where it appears they were selling a miniature car. The item was regularly priced at $34.99 but was on sale for $14.99 for the flash sale. Customers could only buy one to ensure there was enough stock for other shoppers. After the sale, instead of erasing any mention of it—you know, because the sale already ended—AutoZone left it on their website. Better yet, they used it to promote their second flash sale, complete with a countdown clock. 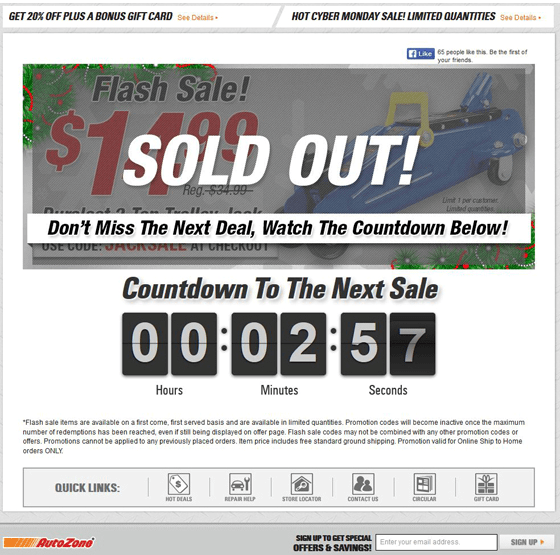 A tactic like this will keep customers lingering on your website so they didn’t miss yet another sale. Ah, freebies. Who can resist ‘em? Free gifts become especially tantalizing around the holidays, when everyone is strapped for cash buying gifts for loved ones. Last year alone, consumers around the country plunked down $5 billion on Black Friday, says CNN. As for Cyber Monday, this shopping occasion is no slouch, either. CNBC reports that last year, consumers shelled out $6.59 billion, the highest in Cyber Monday’s 13-year history. After spending so much money, if a subscriber can get something free just from opening your email, then why wouldn’t they? Of course, most of the time, there’s a catch. 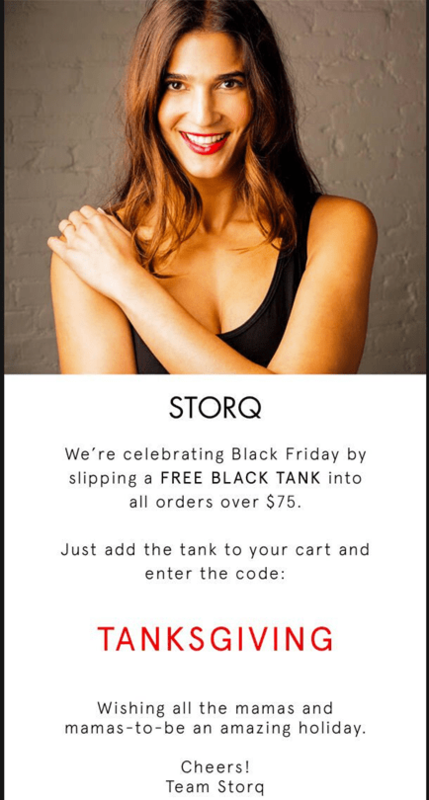 Take the retailer brand Storq, which was giving away women’s black tank tops for free. You had to use the code TANKSGIVING and spend more than $75 to be eligible for the deal, though. After all, your company has to make money some way, right? By giving stock away for free, you’re losing money. Instead, present your subscribers with a freebie that requires them to spend some money first. If it seems that Black Friday starts earlier and earlier, that’s because it does. The inbox of your average subscriber is oversaturated on Thanksgiving weekend. It’s hard to stand out among hundreds and hundreds of emails unless your messages are ultra-targeted or you’re giving away stuff for free. That’s why some companies have begun their Black Friday sales a little early. Doing so on Thanksgiving can be dicey. According to an article on Forbes from last year, opinions on Thanksgiving shopping vary. In the article, Forbes cites a study that found that last year, more than half of consumers (58 percent) planned to do some Thanksgiving shopping. Contrasting that information is data from BestBlackFriday.com. They said that, in 2016, 55 percent of consumers didn’t want to see retailers open their doors Thanksgiving night. It was an even stronger argument in 2017 when almost 60 percent of consumers reported feeling that way. For that reason, you might run your Black Friday sale the Wednesday before Thanksgiving. If you do indeed offer a Thanksgiving sale, then maybe keep it online-only. 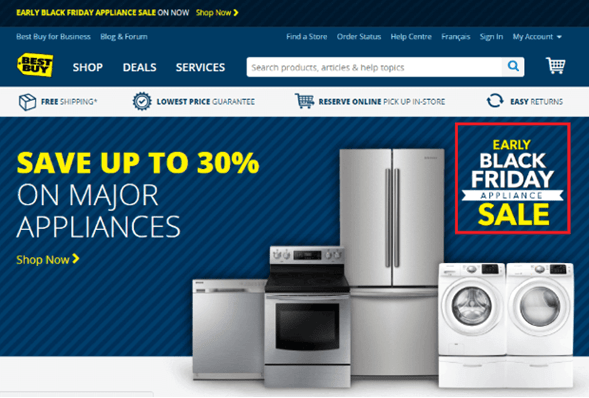 This example from electronics retailer Best Buy wasn’t clear when their early sale started, but hey, 30 percent off appliances is a pretty spectacular deal nonetheless. You saw those Black Friday and Cyber Monday spending figures for 2017 earlier in this article. Just to recap, last year, consumers dropped $5 billion on Black Friday and $6.59 billion on Cyber Monday. When your subscribers buy something from you, give them something back in return. Make it unique, too, such as an entry into a contest or giveaway. That’s what adventure gear brand Huckberry did. 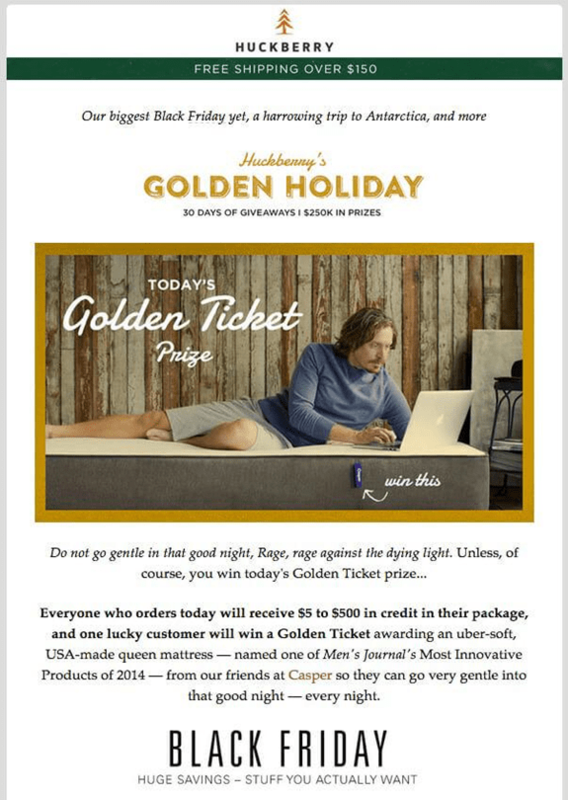 They sent their giveaway email on Black Friday, when most people would be more receptive to their emails. All the subscriber had to do was make a single purchase, and automatically they’d receive between $5 and $500 worth of credit. That total may have been tied to the amount of money the customer spent on their purchase, but that’s unclear. On top of getting credit back, customers would also be automatically entered to get their very own Casper mattress. This seemed to be part of a longer-term campaign for Huckberry, as the email mentions they’ll be doing giveaways for 30 days. By hosting giveaways or contests on major shopping days like Black Friday and/or Cyber Monday, you’re appealing to potentially your biggest audience yet. Cyber Monday, and to an extent Black Friday, are all about nabbing the best codes on the Internet to get the steepest discounts. When these codes are just a random string of numbers and letters, they’re tough to remember. Why not make life a little easier on your subscribers by coming up with a fun discount code like retailer Asos did? Their “GOGOGO” code is incredibly easy to remember. There’s no numbers, no strange letters, just one word repeated three times. Considering your consumers will be blitzing from one website to another to another on Cyber Monday, creating a customer-friendly code like this will benefit them. It’ll benefit you as well, since these kinds of discount codes have a higher likelihood of being used. Many employees across the country get a lengthy Thanksgiving break, but once Monday morning rolls around, it’s back to work. Considering that Monday is Cyber Monday, not everyone will be in work mode. The Business Journals shared a report from Robert Half Technology that noted that, in 2017, 23 percent of employees were shopping that day instead of working. That’s not that many people. Some people are so tired from the holiday festivities that they completely forget it’s Cyber Monday until it’s too late. Makeup brand Julep decided to extend its Cyber Monday sale a whole 24 hours into Tuesday. Doing so gives your subscribers a chance to shop after work Monday night or even Tuesday at work if they’re so inclined (although maybe do so discreetly!). Whether you need Black Friday email ideas or a new campaign plan for Cyber Monday, we think the above 10 examples hit the mark. 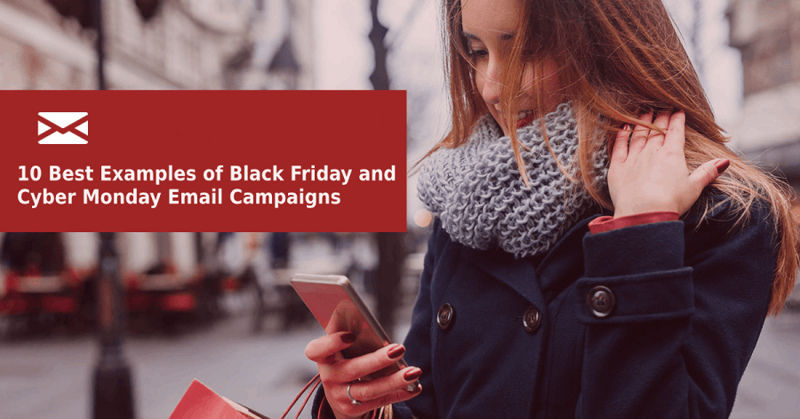 From subject lines to images, content, and more, you now have a loose Black Friday and Cyber Monday email template to follow for your own holiday email campaigns. Good luck!